The Perfect Live Music & DJ for your Perfect Event! Chuck Lawson provides Professional Live Music & DJ for Wedding Ceremonies, Receptions, Rehearsal Dinners, Private Parties, Corporate Events, Special Event, Festivals, & More! 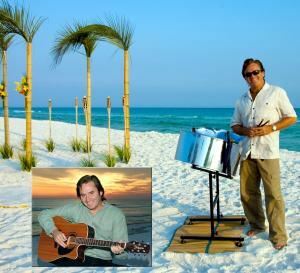 Live Steel Drums, Guitar, Solo One Man Band, Full Service DJ, & More! You get the Best of Both for the price of One! Everyone hears music they know and love… Everyone!!! Caribbean, Calypso, Reggae, Rock, Country, Classic Rock, Oldies, Pop, Dance, & More! Professional, Unique, & Memorable! Book this Award Winning Professional & ALL your Music worries go AWAY! Chuck is your Music… Chuck is your Party!! !